Italian football is no longer the same it used to be decade ago but slowly clubs are starting to spend big in recruiting talented players and it shows in top 5 teams wage bill increasing at the start of 2015-16 season. However bottom clubs are struggling to match the spending powers of big Italian team. 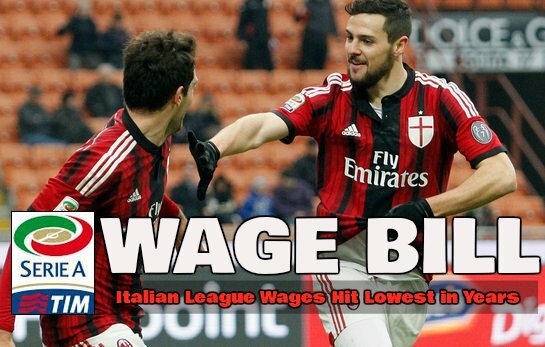 We have compiled the list of wage bills of all Italian top division clubs from 2014-15 and 2015-16 seasons. Its been a few years since level of competition in Italian Serie A has been going down and all the big clubs are failing to attract top young players around the world. But unlike the previous few years Italian clubs spent big in summer of 2015 in recruiting new players and top 5 clubs wage bill increased. Juventus wage bill increased from €122m to €124 million with Paul Pogba signing a lucrative contract extension and they brought number of quality players to replace big names like Vidal and Tevez. Two of the italian power house clubs Inter Milan and AC Milan has significantly increased their wage bill, specially Inter Milan who brought in Roberto Mancini and spent big in recruiting high profile players taking their yearly wage bill to massive €94m from only €70.2m in 2014-15. AS Roma is another team who continue to splash the cash as their wage bill increased from €94.5m to €113m in 2015-16 season. Below tables shows official numbers published in Italian media at the start of this season.